The ranks of the uninsured plummeted in early 2014, as millions gained health insurance coverage through Obamacare, new government data released Tuesday found. There were 41 million Americans lacking coverage in early 2014, down from 44.8 million last year, according to the National Health Interview Survey, the first official government look at the uninsured after Obamacare policies kicked in on January 1. 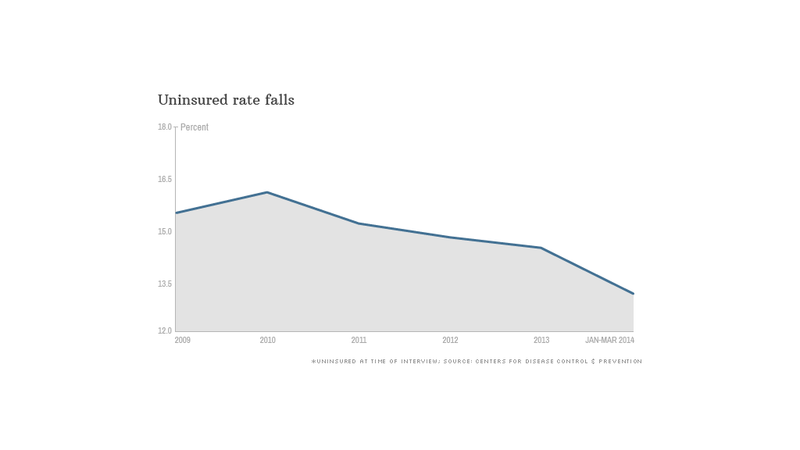 The uninsured rate fell to 13.1%, from 14.4%. The survey, conducted by the Centers for Disease Control & Prevention, interviewed more than 27,600 people from January through March and asked them their coverage status. It also detailed whether they have private policies or participate in government programs. While the report does not attribute the decline to Obamacare, it does show the health reform is meeting its prime directive -- reducing the number of uninsured. Some 3.7 million respondents, or 1.4%, said they were covered by policies bought on the federal or state-based health insurance exchanges. "This is probably one of the largest decreases we've seen," said Robin Cohen, a statistician at the CDC's National Center for Health Statistics. The CDC survey eclipsed the release of the Census Bureau's annual health insurance report Tuesday, which showed that the uninsured rate in 2013 fell to 13.4%. The Census report did not capture any Obamacare influence since policies bought on the Obamacare exchanges didn't kick in until the start of this year. The Census Bureau changed the methodology of its health insurance questionnaire for 2013, making comparisons with previous years impossible. Even the CDC survey, however, doesn't give a complete picture into Obamacare's effect on the uninsured. Many people signed up for coverage late in the enrollment cycle, so their policies didn't kick in until May. The survey's second-quarter data, which will be released at year's end, will capture those enrollees. The report found young adults had the largest drop in uninsured levels. The share decreased from to 20.9%, from 26.5%. Many of them gained coverage through public programs, such as Medicaid. 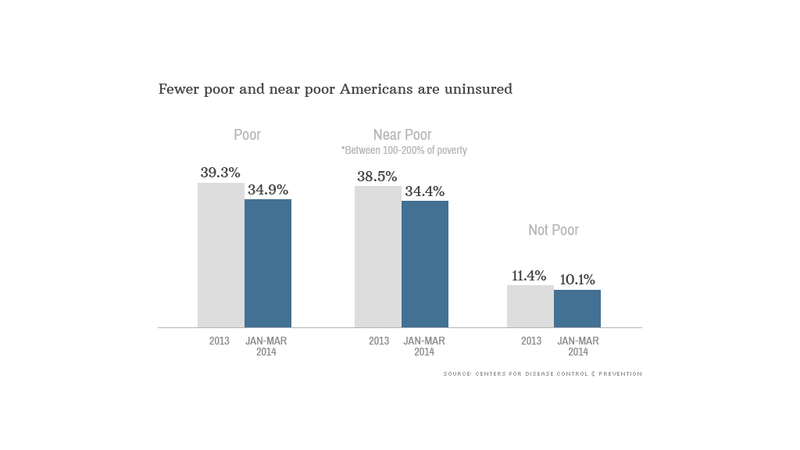 The uninsured rates of those in poverty and near poverty also declined sharply. These folks gained coverage both through private policies and public programs. Under Obamacare, just over half of states and the District of Columbia expanded Medicaid to cover everyone under age 65 up to 138% of the poverty level. Related: Are you middle class? The survey found that adults in states that expanded Medicaid were more likely to be insured -- the uninsured rates in these states fell to 15.7%, from 18.4%. There was no significant decrease in states that didn't expand Medicaid. 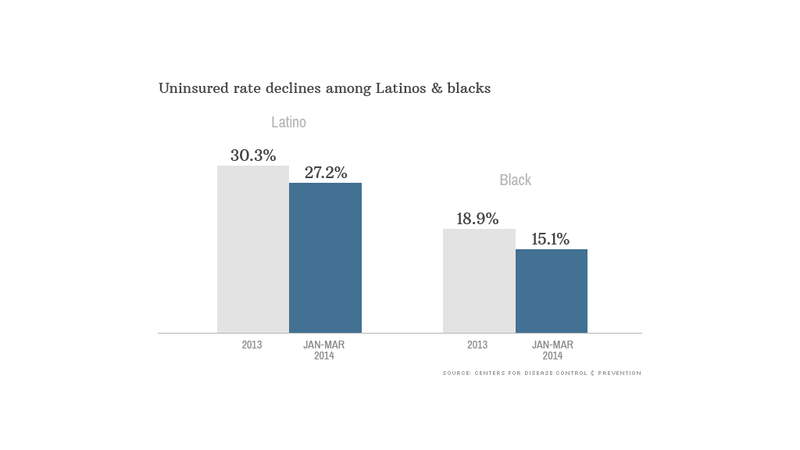 Latinos and blacks also saw their uninsured rates fall. The Obama administration and community activists pushed particularly hard to sign up Latinos and blacks because they are more likely to lack coverage. However, inroads, particularly into the Latino community, were stymied by language barriers and fears that undocumented family members could be deported. Only 10.7% of those who signed up for Obamacare were Latino and 16.7% were black. Just how well Obamacare is working remains to be seen. The Obama administration reported in the spring that 8 million people signed up for policies on the health care exchanges. But it's not known how many people completed enrollment by paying their first month's premium, nor how many were previously uninsured. Open enrollment for 2015 begins Nov. 15.